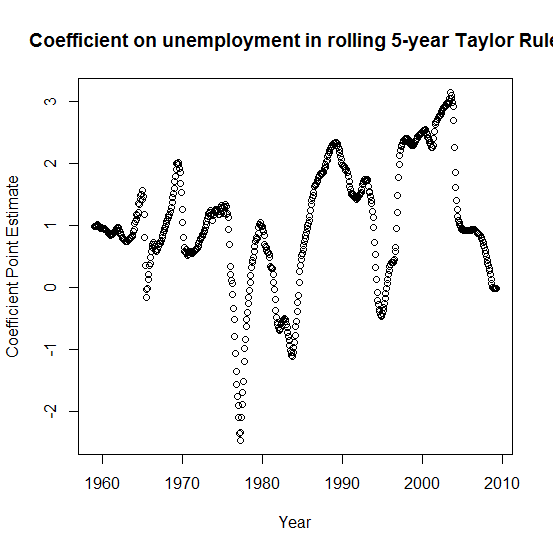 How has the Taylor Rule performed? The Taylor Rule is a theoretical equation that supposedly predicts what the Federal Reserve will set the nominal "fedfunds" interest rate at, depending on the inflation rate and unemployment rate at the time. Some version of it has reigned at the heart of all monetary macro models since the late 1980s. The equation looks like this: [$$]r=\pi+\alpha\left(\pi-\pi^*\right)+\beta\left(u^*-u\right)+\gamma[$$] where [$]r[$] is the fedfunds rate set by the Federal Reserve, [$]\pi[$] is the inflation rate, [$]\pi^*[$] is the target inflation rate, [$]u^*[$] is the estimate for "full employment" also known as the "non-accelerating inflation rate of unemployment" (NAIRU), [$]u[$] is the actual unemployment rate, and [$]\alpha,\beta,\gamma[$] are constants picked by the Fed. I found data for [$]r[$], [$]\pi[$], [$]u[$], and [$]u^*[$] on FRED. Recently, the Fed has announced an inflation target of 2 percent, though as best as we can tell this is what it has always been. Because there's no variation in [$]\pi^*[$] this leaves our model technically underidentified, but we can back out the estimates by rewriting the equation as [$$]r=\left(1+\alpha\right)\pi+\beta\left(u^*-u\right)+\gamma-\alpha\pi^*[$$] which can is straightforward to estimate with OLS. The Taylor Principle says that [$]\alpha\gt 0[$], and we would generally expect [$]\beta\gt 0[$], if the Fed desires to minimize unemployment as much as possible. I won't claim that my regressions are necessarily the most robust analysis, but it certainly seems that the notion of the Fed following any kind of Taylor rule is almost entirely apocryphal. 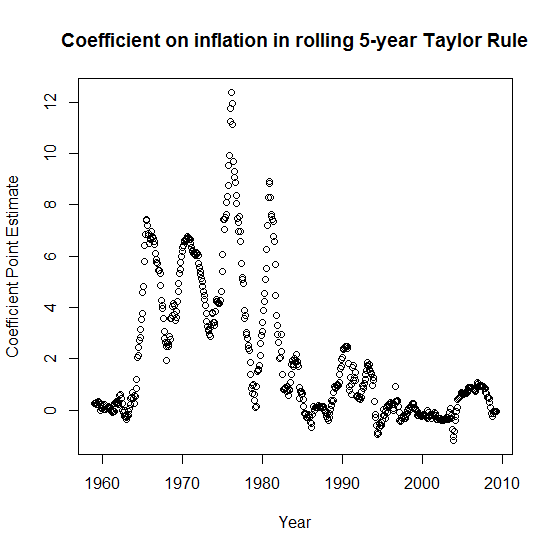 In reality, the coefficients aren't even consistently positive over 5 year periods. Or, to put this into terms John Taylor can understand, the Taylor Rule is not Lucas-robust. Not by a longshot. As always, you're free to review my data (also need this) and my R script file (some editing required). If the central bank is targeting a fixed rate of inflation, the role of the alpha coefficient being positive is as a threat strategy. As long as that threat is credible, expected inflation will not deviate from target, and we would never observe the threat being carried out. 1. Changing inflation targets over time. 3. The Fed's learning over time that it is making mistakes in estimating the natural rates r* and u*.